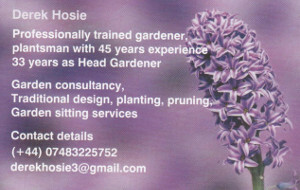 One of our regular readers Murd Dunbar has sent us a copy of a leaflet he received through the door today. 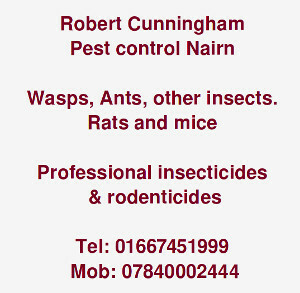 Murd lives in Queenspark one of the areas that could be impacted severlely by development at South Nairn. Well in my opinion and that of ALL I have spoken to have expressed. I have suggested REMOVING THE islands from the brae install three way traffic lights at the Balblair junction something that works at Moss-side on to the A96. This would make using the brae safer. River C.C. 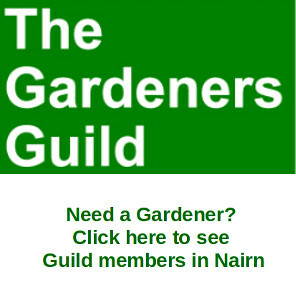 appear to be more focused on stopping Nairn South than making the brae safe for those who have to use it at the moment. Never have I heard any what I would consider a sensible suggestion for making the brae safer from any of the meetings I have attended. Surely people's safety in the community is more important than trying to stop houses being built. At the moment there is no infrastructure for housing but THE BRAE IS A DANGER TO ALL WHO USE IT. Why try to stop any thing that would improve the brae?" Here at the Gurn we are still of the opinion that the Station Brae is a very unpleasant area for motorists, pedestrians and cyclists alike and it's no good the council saying there is no money to do anything, something has to be done to make that area safer. As for more development, until a credible solution (a flyover, or a tunnel perhaps?) comes up we feel that the idea putting hundreds more houses up there borders on insanity. Let's get building badly needed houses on Sandown first, it's town land and we can invest the profits in more housing and amenities for the community. There's enough room at Sandown to get going on affordable public housing, private housing, self-build, eco-exhibition, tepees - you name it let's do it and just forget about South Nairn! Murd has been unrelenting in his lobbying for improvement to the Station Brae. He wants the safety of that road to be improved. Fair enough. 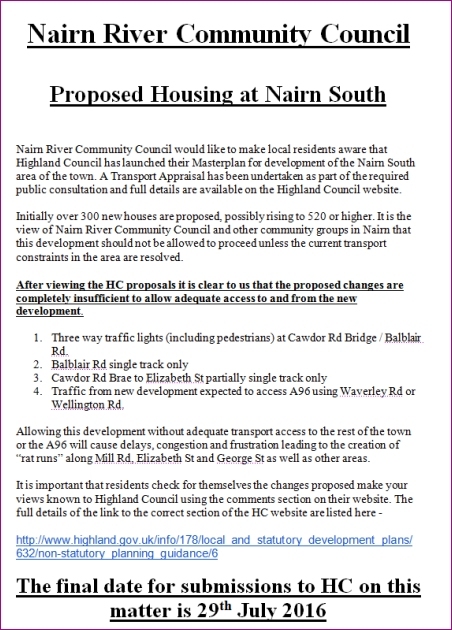 But to take the position that the way to make that road safer is to permit 300, or 500 houses to be built at Nairn South is a classic case of the tail wagging the dog. The Brae may be unsafe now. To double or treble the volumes of traffic on it by building a big housing estate at Nairn South - even with more traffic lights at the Balblair Rd junction/rail underpass - will make that road and those junctions a great deal less safe, and a great deal more prone to jams, backups, blockages and accidents, as well as encouraging 'ratruns' through residential streets. The lessons of Lochloy need to be learned. Over 600 houses were built at Lochloy without any enhancement to the main access roads or junctions, and no additional connection to the A96.... and traffic problems resulted. River CC are right. Building at Nairn South before the (much more complex, difficult and costly) road and transport problems of Cawdor Road and the Station Brae are fully addressed and solutions agreed, is simply stupid. MURD says the gurn ie correct forget the N.S. Now the River C.C. have helped to destroy the environment by producing all the leaflets asking what not to support as far as making the brae safer for all users. Lets hear from what they propose to do about safety for the people they are supposed to represent and make it known what they propose will make things safer on the brae. Nairn South is not the question as far as my suggestions go the safety of users is my concern. I look forward to there leaflet with there proposal on what they them self say is DANGROUS CAN BE RESOLVED. Lights and the islands removed would allow the full use of the road and not force cars to one side close to the pavement. and put the foot down for the space before the other car gets there. It appears to me you are happy to leave the Dangers on the brae as they are? You like the River you offer no alternitive. Lets have your suggestion how to remove the the Dangers that do exist. Before stating what might happen! Well done River CC for reminding me, and I have put in my complaints to HRC to try and get the whole thing stopped - AGAIN. While Murd has his valid points, this cannot be allowed to go ahead under any circumstances and I hope everyone else heeds the leaflet and objects. Is it not possible to re-open the link road between the Balblair Road and Moss-side Road to give access to 'Nairn South' for traffic to/from Inverness. This would need a new Level Crossing at the railway but that is surely manageable. We have to stop this madness. Sorry Murd, Nairn River CC, for all its' faults, is not the enemy here and you are playing straight into the hands of the guilty party - Highland Council - by muddying the water. Well done Nairn River for trying to look at the bigger picture. Don't feel sorry for me it's the people who use the brae that are in danger and already have come to greef using it. As for trying to get things stoped.? Trying to make the brae safe for all is what I am trying to get through to you all readers not building houses. IS THERE ANY ONE WHO THINKS WHAT IS THERE AND SHOULD BE LEFT AND IS NOT A DANGER TO USERS. just add your name to leaving it dangrous! So poor impatient car drivers have to wait a while to get under the bridge, count yourself lucky you are not a pedestrian. Remember pedestrians always have the right of way! Just slow down, there are enough horrible things going on in the world just now, so let's not concern ourselves about how quickly we can get home for our dinner. Interesting one this, the shape of Nairn's planning future to be decided by developers or by the people that live here. Will Highland Council just let this happen or will they listen. Council elections in May will be very interesting if Nairn is let down again. But, Anon@6.45pm, it doesn't seem to matter who gets voted in as local Councillors, they may spout a lot of hot air but they are effectively toothless - what the official's say goes and they are past masters at 'if at first we don't succeed'! @Anon 6.54 at a recent Nairnshire Area Committee meeting there was a vote about all this but it was versed in terms of consultation on the traffic assessment. From that I am firmly of the conclusion that Michael Green and Stephen Fuller are against, Liz MacDonald couldn't vote as you have outlined in your comment and Laurie Fraser voted in a South Nairn friendly way. You are playing straight into the hands of the H.C. That may be true and I would give a donation to them to make the brae safer. Can you tell me what the River have proposed to make it safer.?? Lets look A few fact. 1 Nairn S. does not exist and may NEVER. The danger on the brae exists now. IF anyone cares to look over on Nairn Rocks they will see numerous people claiming to being hit by cars while using the brae. And want it back to what was safer to use..
A man has already spent time in hospital after being struck on the brae.
. 2 Not what might happen if they made the brae safe. 3 One of there own commitee has told me he has experienced trouble trying to use the cycle opening. A woman has fallen off after her bike handles struck the bridge. 4 The overwhelming opinion of people using the brae want it reverted back as to how it was. 5 I am unable to find any reports of any one being injured before it was altered. It would be of interest of any do exist? The safety and the dangers of users of the brae exist NOW and is what ALL councilors should be considering and listing to the people who have to live with the danger. Not trying to predict something that might happen if they make the brae safe. Make the brae safe for people to use NOW. High sided vehicles do have to use the center and always will unfortunately be close to the pavement. But extending the pavement it and allows people to walk closer to the center. Then they reduce what was it was extended by putting bolards ?? The A96 is not on the brae but the danger's ARE. at this very moment . As I have said N.S does not exist. And what if it did. I am being told. it would degrade the Firhall Complexes . Lets they hope they take heed of the community who use the brae.